William Dunklin Garrison was born in Greenville County, South Carolina, on September 6, 1843 to Edmond Barksdale Garrison and Sarah Cureton Garrison. A member of a farming family, W.D. grew up in the Sandy Springs community of Anderson County amid a collection of aunts and uncles. While still in his teens, W.D. joined the Confederacy during the War Between the States, rising to the rank of captain. He was in the 2nd South Carolina Cavalry and at the conclusion of the war, he was with Gen. Robert E. Lee’s army at Appomattox Court House. After the war, W.D. returned to upstate South Carolina and managed the cotton farm of Autum Manufacturing Company, now LaFrance Industries. W.D. 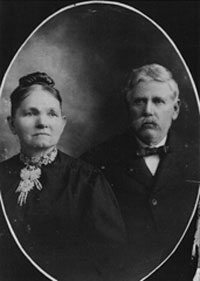 met Ester Annie “Essie” Reid (daughter of Thomas Little Annie Sitton Reid born April 7, 1847) and they were married on December 17, 1868. The marriage was a loving and happy one according to Essie’s scrapbook — a family treasure that has been published by cousins, Martha Nelle Craig (Mrs. Jim) Ligon, and her daughter Polly Ligon O’Grady. On December 4, 1872 at age 29, W.D. bought 273 acres on land between the Blue Ridge Railroad and General’s Road. The land purchased for $2,800 from William M. Rampley bordered land belonging to W.D.’s father-in-law. General’s Road was so called because the Revolutionary War hero Andrew Pickens traveled the route from his home in Abbeville County to a fort located in what later became Pickens County. The road was later called Clemson College Road and is now known as U.S. Highway 76/Clemson Boulevard. It is unclear where W.D. and Essie lived the first several years of their marriage, but it was apparent that they needed a house because they had 13 children. Eleven children survived to adulthood and most married and stayed in the area. The Garrison farmhouse was built in the mid 1870’s. The design was a traditional style for those Victorian days. The two-story house had a wide central hallway on each floor with two large rooms on each side of the hallway. There was a wide porch on the front and east side of the house. Thomas Edmond Garrison (Tom) was the youngest of W.D. and Essie’s children. It was customary in those days that the youngest son stayed home to care for the parents. Tom married Nettie Clifton McPhail on January 17, 1917. Tom and Nettie had four children: Sara, Lounelle, Ed (Thomas Edmond, Jr.) and Nancy. When Tom died in 1945, he willed the house and farm to his widow and four children in equal parts. Ed, who had returned from serving in the Air Force during World War II, was interested in farming and bought from his mother and three sisters their shares with the understanding that he would provide his mother with a comfortable home. 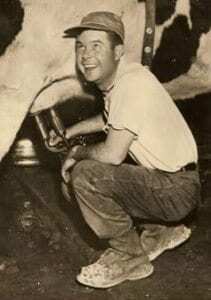 Ed began milking 10 jersey cows by hand in 1945, filling milk cans and taking them to a neighboring farm to be put into smaller bottles for purchase. For 43 years, Ed operated a dairy and general farm program building his heard to over 400 cows. He was a leader in many state agriculture and local organizations (Soil Conservation and Land Resources, Farm Bureau, Young Farmer’s Organization, Elk’s Club, Lions Club, Pendleton Farmer’s Society) and for over 30 years he served in the South Carolina legislature. In 1955, Ed married Juanita Bartlett of Cochran, GA. Juanita grew up on a peach farm and finished the University of Georgia with a degree in journalism. Juanita was working in Seneca, SC, as a newspaper reporter for the Seneca Journal when she and Ed were set up on a blind date. Ed and Juanita built a house across the road from the farmhouse and lived there until Nettie Garrison died in 1972. Ed and Juanita moved into the farmhouse in May of 1973 after renovations were complete. Ed and Juanita had six children or as Ed used to say “four children and the twins.” The “spring crop” of children are Carol Gaye Garrison Sprague, Thomas Edmond Garrison III, (Tom), James Bartlett (Bart) Garrison (1960-1990), and Anita Lee Garrison Smith. The “fall crop” was a bit of a shock when 11 years after Lee was born, Juanita delivered not one but two babies, Elizabeth Reid Garrison Rasor and Catherine Anne Garrison Davis. 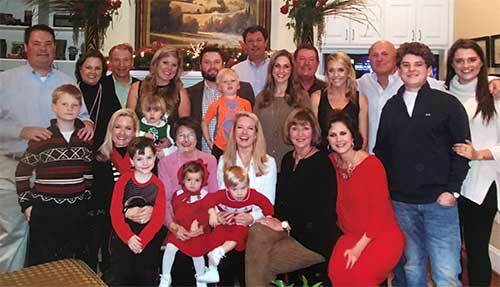 All six children (and later his grandchildren) followed their father’s lead by graduating from Clemson University. In January 1989, Tom and Bart leased the farm from their father, Ed, and continued the dairy and general farm program. On May 9, 1990 at age 29, Bart died in a tragic silo accident on the farm. He is buried across Clemson Highway in the small cemetery of Welcome Baptist Church – a church founded in the front parlor of the Garrison farm house in 1889 – along with his grandparents and great-grandparents. In April 1994, the dairy herd of Holsteins was sold and Denver Downs farm program changed focus to corn, soybeans, small grains, and beef cattle and vegetables. A Farm Market open from Memorial Day through Labor Day was added. In 2000, this land’s fourth generation farmer Tom Garrison III, cut the first corn maze at Denver Downs. Several of his siblings now help with the annual Corn Maze & Giant Pumpkin Patch Fall Family Festival held every October. The farm hosts other events for the community throughout the year including an Easter Egg Hunt, Concerts, and Specialty Food Festivals. Denver Downs venue areas are leased for private events year round. On Father’s Day, June 16, 2013, after church, and lunch with family, T. Ed Garrison, Jr., passed away peacefully at age 91. T. Ed. Garrison, Jr., was an outstanding farmer, distinguished Clemson Alumnus, proud South Carolinian, and decorated WWII War Veteran. The Livestock Arena at Clemson University in Pendleton is named in his honor. Several of the generations surviving W.D. and Essie’s have died, but many of their great-grandchildren, and great, great-grandchildren live in the area. The family hopes to preserve and share our heritage with our community for many years to come. The Garrison Farmstead (Denver Downs Farm) is listed in the National Historic Registry.